ROTC at TCC? Yes, you can! If you’re interested in ROTC, don’t wait until you transfer to a four-year. Start here! You want to join the military as an officer and attend Tidewater Community College? Why not join ROTC while at TCC? “It’s really worth it if you want to challenge yourself,” said Brandon Hobbs, an I.C. Norcom High graduate earning his Associate of Applied Science in Information Systems Technology at TCC. Hobbs along with TCC students Lindsey Lebree and Tyler Johnson each took the Midshipman Oath last week, which marks their transition from Midshipman candidate to Midshipman as part of the Navy ROTC program. The Reserve Officer Training Corps is a four-year program designed to prepare students to join the military as an officer. Even students unsure of whether they want to commit to the military can participate in the first two years, which are orientation with no requirement to serve. When students transfer to a four-year school, they continue with advanced ROTC courses, which require a commitment to the military with a certain amount of time to serve, depending on their specialty. 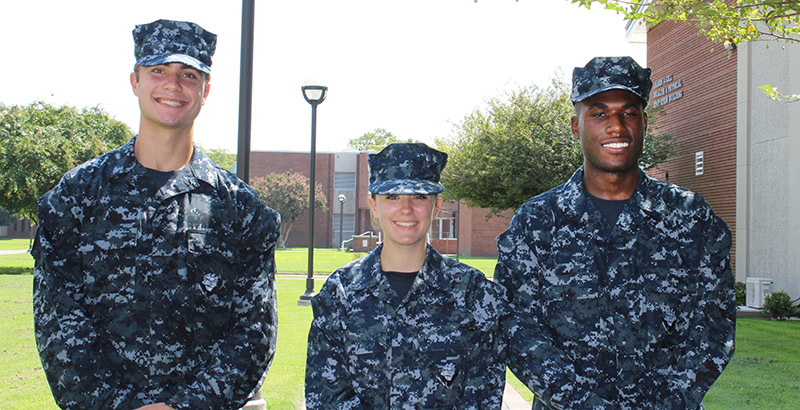 Students must earn their bachelor’s before entering the military as an officer. “When you’re starting at TCC, you have the option for both the Army and Navy ROTC,” said Bill Brown, executive director of TCC’s Center for Military and Veterans Education (CMVE). “If you want to serve, ROTC offers you the opportunity to earn a commission in the military. Being an officer in the military opens worlds up to you. As Old Dominion University is the local headquarters for ROTC, TCC students take all their ROTC classes there, potentially at no cost to them. The CMVE offers scholarships that can cover the cost of their ROTC courses, each two credits per semester. Students can apply for additional ROTC scholarships as well. Lebree from Berkley Springs, W.V., learned about the ROTC program after meeting with a CMVE academic advisor. She jumped at the opportunity after previously being enlisted with the reserves. All the students plan to transfer to either Old Dominion or Norfolk State University. For information on joining ROTC at TCC, call 757-822-7777.